When Kimbal Musk graduated from New York's French Culinary Institute in 2001, he had no clear vision of the future. A high-tech entrepreneur from South Africa, he had done well in Silicon Valley (along with his brother Elon, Musk has invested in several successful ventures, including PayPal) and was ready for a new career. Musk had always wanted to learn to cook, but wasn't yet sure where that might lead. Then the Sept. 11 attacks hit Lower Manhattan, where Musk was living. He spent the weeks that followed helping David Bouley and other volunteers feed firefighters and rescue workers out of Bouley's eponymous downtown restaurant. "The energy I felt in the kitchen night after night made me realize I had to do a restaurant myself," Musk says. "And it had to be one that helped create the same sense of community I'd experienced there." Musk landed in Boulder, Colo., where he met Hugo Matheson. When Matheson was growing up outside Cambridge, England, nearly everything he ate came from the nearby land. With such a bounty all around him, the idea of importing fruits and vegetables from halfway around the world seemed perverse. "As a kid, I'd never have avocado," he says. "You'd get some melon and the odd fresh peach. But avocados? Mangoes? I'd never had a mango in my life." Matheson cooked in London at the renowned River Café and elsewhere, then ended up in Boulder as head chef at the upscale Mateo. The town was at the center of America's natural food industry, home to companies such as WhiteWave soy and Celestial Seasonings tea, but you'd never know it from its restaurants. "I'd worked in kitchens in London where you knew the butcher, you knew the greengrocer," Matheson says. "It wasn't like that here at all. Two trucks would basically pull up and give you everything you needed." Matheson started visiting some of the small farms in the area to source produce and encountered everything from lack of interest to active resistance. Farmers didn't trust restaurants, he came to understand. "Too many had let them down," he says. At the time, the farm-to-table movement didn't yet exist. A first generation of pioneers, cooking locally sourced food at outposts of progress such as Chez Panisse in Berkeley, Calif., and the Herbfarm in Washington, had proved that such a thing was possible, but they'd had little impact on the culinary scenes around them. "Even New York 10 years ago didn't care about farm-to-table," Musk says. 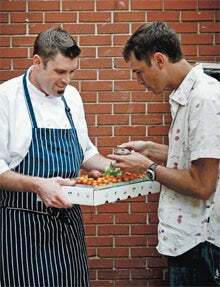 So in late 2003, when the two English-speaking expats decided to meld Musk's idea of a neighborhood kitchen with Matheson's of using as many local ingredients as possible, a template didn't really exist. Musk and Matheson gave their restaurant the purposefully generic name The Kitchen to billboard the place they hoped it would hold in the Boulder community. The idea, as Musk puts it now, was to source food from people they knew and serve it to people they knew. The Kitchen quickly earned the trust of local farmers. "For years, we'd take random deliveries at the back of the restaurant," Musk says. "A bag of arugula, whatever it was. The answer was always 'Yes.'" Existing suppliers appreciated the sense of security that engendered, and it gave others the courage to plant their own farms. Anne Cure left Hedgerow Farms in 2004 to launch Cure Organic Farm in large measure because she knew The Kitchen and other restaurants that followed its lead gave her a dependable customer base. "They make a commitment to buy a certain amount of food each week and they never renege on it," Cure says. "It can absolutely be the difference between a business making it and not making it." These days, there's no shortage of local purveyors around Boulder, where the twice-weekly farmers market now runs two blocks down the length of one street and around the corner onto another. Earlier this year, Musk and Matheson expanded their empire into an adjoining space, serving quicker meals and sandwiches at The Kitchen (Next Door). Together with a flatbread and appetizer bar above The Kitchen, the restaurants now serve some 7,000 customers a week, which calls for a lot of local produce. "We'll guarantee to our purveyors that we'll take a certain amount each week, like 100 dozen eggs," Matheson says. "We might end up needing 150 dozen, but they know that we're good for at least 100 dozen. And if we need more than they can give us, we now have other places where we can go. That has happened in part because of us." In the coming decade, Matheson hopes, they'll open five Kitchens around the country, and many more Next Door properties. Like the originals, they won't slot into an easily definable category, but they will have an ethos. "People always ask what kind of restaurant we have, and it's like a five-minute conversation," Musk says. "The short answer is, 'We're creating community through food.' That's the big idea we had, the product we're exporting. And it has paid off."